"Well worth the read. . . . A] prescient handoff to the next generation of scholars." Over his long career as witness to an extreme twentieth century, National Book Award-winning psychiatrist, historian, and public intellectual Robert Jay Lifton has grappled with the profound effects of nuclear war, terrorism, and genocide. 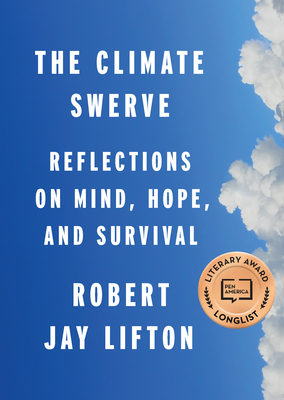 Now he shifts to climate change, which, Lifton writes, "presents us with what may be the most demanding and unique psychological task ever required of humankind," what he describes as the task of mobilizing our imaginative resources toward climate sanity. Thanks to the power of corporate-funded climate denialists and the fact that "with its slower, incremental sequence, climate change] lends itself less to the apocalyptic drama," a large swathe of humanity has numbed themselves to the reality of climate change. Yet Lifton draws a message of hope from the Paris climate meeting of 2015 where representatives of virtually all nations joined in the recognition that we are a single species in deep trouble. Here, Lifton suggests in this lucid and moving book that recalls Rachel Carson and Jonathan Schell, was evidence of how we might call upon the human mind--"our greatest evolutionary asset"--to translate a growing species awareness--or "climate swerve"--into action to sustain our habitat and civilization. Robert Jay Lifton is a psychiatrist who has written more than twenty books and edited many others, including many seminal works in the field such as the National Book Award--winning Death in Life: Survivors of Hiroshima and The Nazi Doctors: Medical Killing and the Psychology of Genocide. He lives in New York City.